2010: Another record breaking winter. So what happened to global warming? Britain and Europe have been hit hard for the third straight record-breaking winter season. Labeled by experts as the coldest winter in 100 years and set to blow well into 2011, it is already raising some very interesting questions about the new ideological split we are witnessing throughout society in the much-elebrated green debate. Yet another record-breaking winter in Britain, could this be a trend? Go figure. Photo: Patrick Henningsen. Tonight Britain braces itself for a further 10 inches of snow and more sub-zero temperatures to come- with no let-up, top forecasters have warned. These unusual Arctic conditions are set to last through the Christmas and New Year bank holidays and beyond and as temperatures plummeted to -10c (14f), prompting the UK’s Met Office to state that this December 2010 was ‘almost certain’ to become the coldest since records began in 1910. So is it not safe to say that we are witnessing a real, tangible and physical trend here? Unlike the million dollar computer-generated climate model projections produced by the UN’s elite circle of research grantees and bursury award-winning climate scientists, this new trend is actually a real one- one we can feel, touch, and most importantly… empirically measure. Indeed, it is Britain who has been hit, yet again by a siege of blizzards and freezing temperatures. As public transport and utilities face continued disruption in services, major airports are reporting closures as the snow drift continues to pile up. It seems that temperatures will struggle to rising above freezing points for the second straight day and this will sure spell more chaos for the general welfare. For a relatively moderate, low altitude climate zone like the UK, such winter storms can cost lives and create an endless backlog of crisises that municipalities will have difficulty managing. There is a rather bizzare upside of course. If you count yourself as one of the millions worldwide who find yourself living in constant fear of global warming and climate change, there is one positive, reassuring aspect to this now bonafide and well documented global cooling weather trend since 1998. This essentially means that you can now safely get out from under the bed and breathe a sigh of green relief as you look out your window to see everything covered in thick white again. Yes, yes, you are completely and utterly safe from CGI-created scary visions of sea levels rising- as seen in the science fiction “cult” film, Age of Stupid (yes, those are CGI graphics and no, sea levels are not rising), allegedly due to that arbitrary phantom menace… of climate change. Still though, this hasn’t stopped thousands of green-washed activists, hippies and guilt-ridden corporate rehab patients in search of a low calorie religion from chasing their paper tiger further into that endless political forest. A generation lost to indoctrination from up-on-high, high, high up some of the world’s leading investment banks and arcane think tanks. And the hippies, well they are also high, of course. 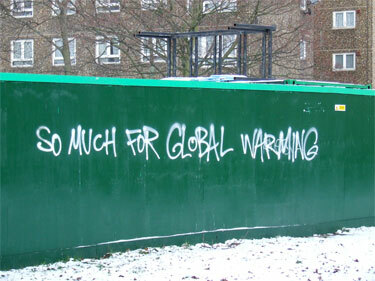 The Club of Rome (official creator of the global warming scam) and the UN’s own well-documented programmes of social engineering and department of political division have seen some resounding successes, particularly between 2004-2008 when the ideological zeitgeist of global warming and its new alter ego climate change, started heading south for the winter (all the way south to Antarctica, in fact). The inevidable collapse of the Chicago Climate Exchange (CCX) is one recent sign that the whole effort to monetise and control Western lives through this coersive puedo market is struggling to maintain its illusion of green utilitarianism. The writing was on the wall this past summer and went unnoticed by most green activists and passive spectators in the great climate debate. Although initial investors and shared holders managed to jump ship with their fortunes in tact in, the end, it was simply “unsustainable”. If you have unwavering faith in men like Al Gore, the UN’s own knighted IPCC body of 40-odd climate scientists and the Guardian’s resident earth expert George Monbiot, then you have effectively swallowed the blue pill. Here you have a license to switch off your critical thinking faculties, because in your mind you can hear the following phrases, successfully implanted there, over and over again. “The debate is over, the science is settled, every scientist agrees”. Like a good Catholic, a Jew, or Muslim, you take the climate scriptures word for word. You are a true believer, one who somehow knows in your heart that there is a thing called man-made CO2-driven global warming. It simply must be. And there is a ready-made crowd waiting for you at the church, where everyone is singing happily from the same hymn sheet- literally. What once passed for education in the West, was transformed into a top-down waterfall of relentless green propaganda- drieven by a multi-billion dollar gravy train of state-subsidised financial opportunities. And in the most bizzare turn of green idealogy seen yet, more and liberal-minded zealots are now claiming ”that global cooling is what we must expect because of global warming?” If you are in any doubt as to the reality of this new claim, just ask any climate change advocate yourself and you will be amazed to hear this new party line stated. Another idea has been successfully implanted into the minds of this faithfull flock. And then you have the skeptics- the demonised, the mavericks, the outcasts(of whom this author is one, and has yet to receive any money from ‘big oil’ etc) often stoned in public for challenging Herr’s Gore, Strong, Hansen, Mann and Jones on certain hack aspects of their sacred computer-modeled science. The doubters knew something wasn’t right when Wall Street started its hedging and hyping of the world’s most innovative financial instrument yet- carbon emissions. They knew something was off kilter when carbon taxes inevidably became to main thrust of global warming shills and the United nations. So after a third straight year of frostbite and ice skating down your neighborhood street and into a lamp post, it’s gone beyond a joke. You simply have no choice but to swallow the red pill. It seems that the only people in denial are the religious followers of the IPCC’s new Jonestown Church of climate change… drunk on a dellusion that they are, in their own little way, saving the planet from the evil substance known as CO2. It’s become a sort of tribal division, where two tribes cannot seem to agree if the Sun orbits the Earth, or the Earth orbits the sun. Throughout history certain tribes of people need mythologies in order to give meaning to their lives. Climate Change is simply the latest mythology for this current epoch. In the 21st century, we thought modern man had surely advanced past this handicap, but alas… old habits die hard. Alice… are you there Alice?